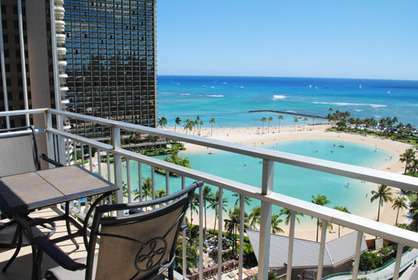 2 bedrooms are rare in Waikiki and this one has the best views you will ever find in a oceanfront condo in Waikiki !!! 2019 updated with all new dining room set, TV console, coffee table and guest bedroom furniture. 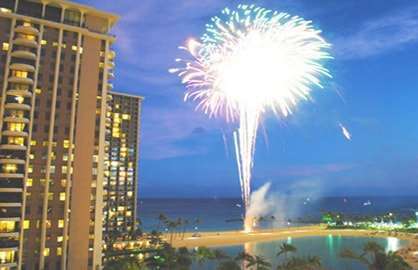 Just watch the surfers right outside your lanai, best spot to watch beach activities and the best viewing spot of the Friday Night Fireworks Show! September 2017 an all new full Split Air Conditioning System with 3 units was installed, one for each bedroom and one for the living room ensures quiet cooling comfort while on vacation. This great 2 bedroom, 2 bath condo is 1000sf with 240sf of additional lanai (balconies) and has high end living room furniture that includes a queen size sofa bed. This incredible condo is the most sought after position at the Ilikai with the best possible ocean, beach, sunset, fireworks and luau views in the building !!!! 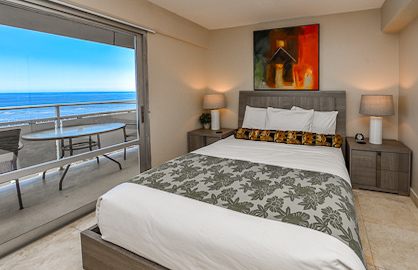 You can't ask for better views than this unit at the Ilikai. 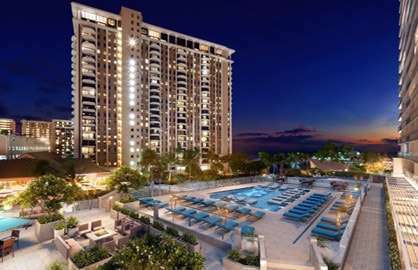 The 44 stack is the end unit overlooking the beautiful Hawaii Pacific Ocean, lagoon, Waikiki Beach, sunset views, luau views and no better position in Waikiki to see the Friday night fireworks. Both bedrooms have a queen bed and there is a queen size sofa bed in the living room. There is a modern full quartz counter topped kitchen with stainless steel stove, oven, microwave, fridge, Bosch dishwasher and a very large dining area and table perfect for entertaining. 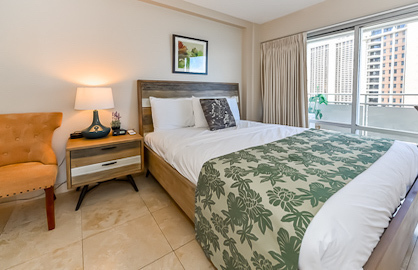 This unit has the two best located lanais at the Ilikai, one off the master and living room, and the other lanai off the dining area and second bedroom. 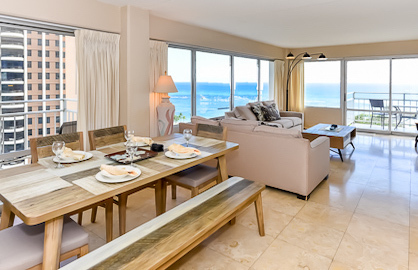 If you want your vacation in Hawaii to be filled with these endless perfect hawaiian ocean views, sipping wine and watching the surfers right in front of you, don't delay, book this unit now, it will fill up fast. ** High Speed Wifi included with unit. *** Free local, USA and Canada calls included. 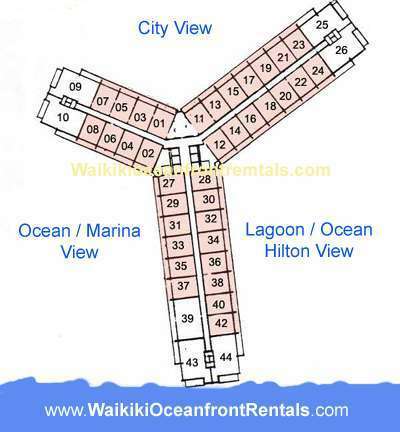 ***** Although legally 1 bedroom units, all Ilikai units are either studio units or 2 bedroom units. 1 bedroom units do not have a separation wall between the bed area and living area except those listed as having a sliding wall. A list of sliding wall units are on the faq page. For earlier checkins, see our Early Check In Options. 11 a.m. 14.962% 3 nights if same day as another check in or check out, otherwise 4 nights. See our all unit calendar to check. 189.00 30% to reserve dates. Remainder due 30 days before arrival. Availability calendar is 100% accurate and live online. Dates are blocked out instantly when a booking is made and can change at any minute. There is never a need to request availability, just refer to the calendar below. The system will not allow a double booking. Regular check in times for the dates below are 3pm and regular check out time is 11am. Please read our FAQ Page for early arrival and late check out options and never request an early check in till the day before arrival. 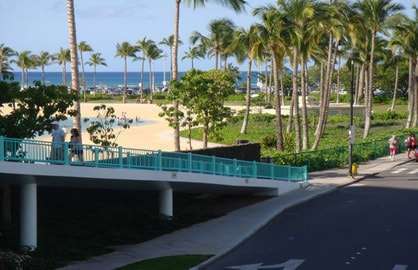 The Ilikai back foyer has a ramp that drops you right on the lagoon on the ocean side. You can park free on the left side during the day for up to 6 hours. These spaces always fill up with surfers during the day but open up throughout the day. There is no parking after 10:30pm in the free parking area. All cars are towed right at 10:30pm sharp so don't forget your car there. Directly across from the free parking spaces there are numbered paid parking stalls that you can use for $1 an hour. Park in any stall and purchase your ticket from the machine at the entrance to the lot by can choose any amount of hours you want. You can choose any amount of hours you want for your stall. The machines take cash and credit cards. Valet parking is available 24/7 and is $28 a day with in/out privileges, of course you must tip for each time. Please check the rate on arrival. No reservations needed. Just arrive anytime and valet staff is on duty. The bell captain or valets can assist you with your bags and deliver them to your room when you arrive or when you leave. Tip is usually $1-$2 per bag. If you wish to rent an underground parking stall on a monthly basis, the rate is $250 a month, minimum stay of 2 months (based on availability) to qualify plus a $25 non refundable activation fee. Make sure upon arrival you ask valet about this. Sometimes the hotel will not offer long-term parking so best to call the hotel directly if you need this. Across the street on the west side on Hobron Lane is Red Lobster. There is a parking garage located there that offers parking for $23 per day. Please check rates upon arrival. Ilikai 1444 - Our family of 4 stayed at condo 1444 for 5 nights in December (2018), the condo was beautiful, the water view was magnificent. The condo was very clean and beautifully decorated. The views over the ocean, lagoon, and marina was great. Our family enjoyed sitting on the lanai watching the Hilton Hawaii Village fireworks. 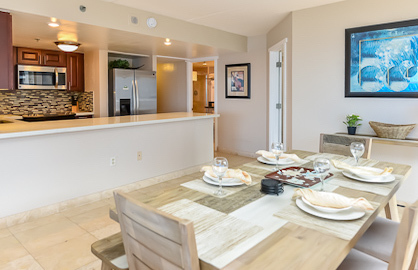 The Ilikai is conveniently located to all the shopping and great restaurants, 5-10 minutes walk. Checking in and out was super easy and stress free. The condo owner was very kind to granted us late check out since we had a 11pm flight out of Oahu. 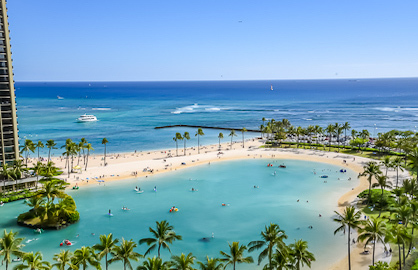 The condo owner and Waikiki Beach Rentals were easy to work with, very responsive to all our questions. Thanks so much for making our Hawaii vacation a memorable one! 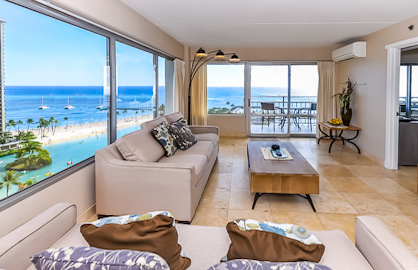 Ilikai 1444 - Great apartment, views over lagoon, sea & marina were great. Amazing to be sitting on the deck watching the Hilton Hawaiian Fireworks. 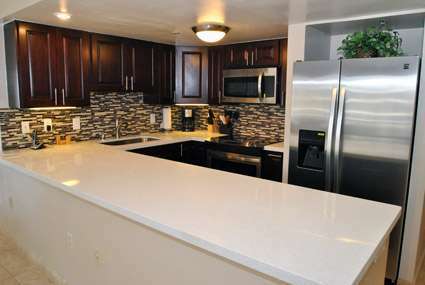 Apartment has been very well maintained & suited our family of 5 perfectly. Good location with most tour buses & shuttles stopping right outside. Ilikai 1444 - 'm just leaving a four night stay at room 1444. I can't say enough good things about the condo. The views are to die for and the condo is large, tastefully decorated, and the kitchen is well-stocked with all the necessities. The location was perfect for us (just enough action without being congested!) and the access to the Lagoon right outside the condo was amazing. The owners were very receptive and even granted a late checkout as there was no one booked the following day. This made the last day so relaxing as my flight was not until quite late. 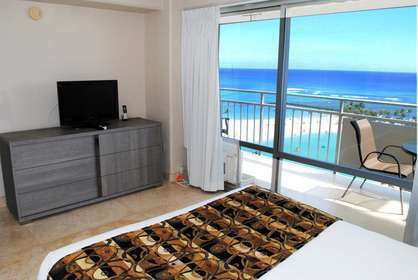 I will certainly book this condo again if my travels take me back to Oahu! Ilikai 1444 - My husband, myself and our two adult kids spent 7 nights at the Ilikai unit 1444. The location can't be beat and the views are amazing!! 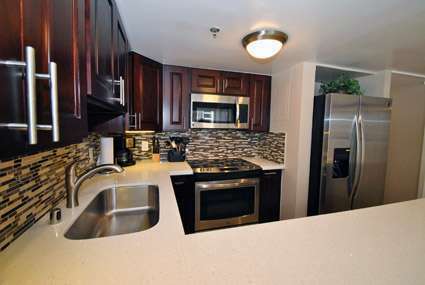 The condo's corner unit was spacious and gave excellent water views from the three balconies. It was recently updated too. 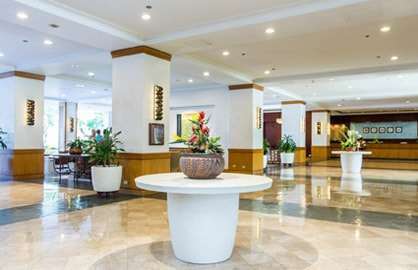 The condo itself is a short walk to all the action but still far enough away to not feel congested. We hope to return to 1444 someday! 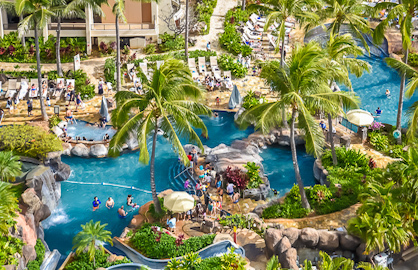 If anyone is on active duty in your group in the military, their ID can be used for various discounts especially at the Hale Koa. There are MANY discounts with military ID. We rented surfboards, paddle boards and bogie boards for half price. We also got 20% off for "Sail & Snorkel" at the HiltonPier. Some vendors gave all four of us the discount. Btw, our son completed his army contract last summer but still has his expired ID and every vendor accepted it. Just ask!! There isn't a thing I would change at 1444 Ilikai!!!!!! It's said to be over but we created many wonderful memories!!!! Ilikai 1444 - We just returned home from a wonderful vacation, we stayed in unit 1444, it was magnificent! The condo is just beautuful, modern and very spacious. The view from every room is breathtaking. The Ilikai is on the quiet end of Waikiki which is just what we wanted. We were close to the action, but at the end of the day returning to the condo and the views of the ocean and marina was so relaxing. The condo has everything you need, the worst part was leaving. Thank you Waikiki beach rentals and the owner of this condo. You were very easy to work with and very quick to respond to my questions. I can honestly say this was by far one of the best vacations we have ever had. Your home is lovely. We will be back someday! We loved our stay in Ilikai condo 1444. 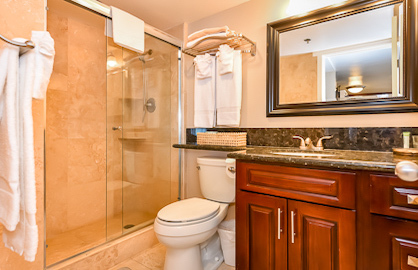 The condo was clean and well appointed with everything we needed and more. The kitchen was full size, so we could decide to cook or eat out. The view from the balcony was the best, with lagoon view and marine view. We had prime viewing every Friday and Tuesday night for the fireworks at the lagoon. 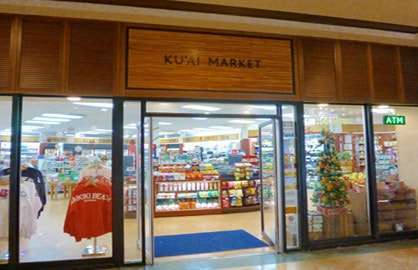 We were perfectly situated between the Ala Moana shopping centre and the main shopping strip in Waikiki and we could walk to both. There were plenty of places to eat within walking distance, you could easily get by without a car. My family had a fabulous holiday and I would recommend this unit, we will definitely come back and stay here, I wouldn't want to stay anywhere else. Unit 1444 was the perfect unit for myself & my close friends. The 2 Terrence's were ideal for overlooking both the turquoise water of the Pacific Ocean and the Luau at the Hilton Hotel!! I woke up every morning seeing sunshine, surfers and the inviting blue sea. If I have the privilege of returning to Oahu, I would definitely return to the same unit. We really enjoyed our stay at condo 1444 in the Ilikai. The 2 BR unit was perfect for the 4 of us for 5 nights. 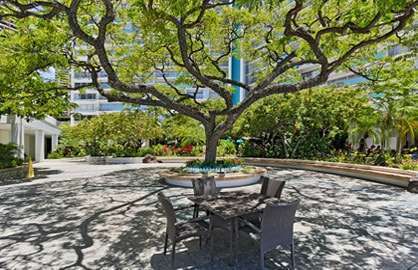 The condo has beautiful views of the ocean and lagoon and the location is very convenient for the beach and Waikiki shopping and restaurants. The decor was very nice. Overall, a great unit for a vacation. My family stayed in unit 1444 for 4 nights in January. This unit is stunning. There are views in all directions, marina, ocean and city. The beautiful lanais invite you to sit and relax and enjoy. The unit is very large, two comfortable bedrooms and a big living room, dining room and kitchen. Well stocked with all the basics an apartment needs and tastefully decorated. If you compare this to what you would pay for an equivalent size hotel room with even half of the view, it is an incredible bargain. 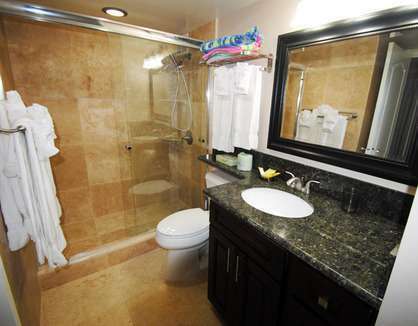 It really feels like your own home, but with the amenities of a hotel and a few minute walk to everything. 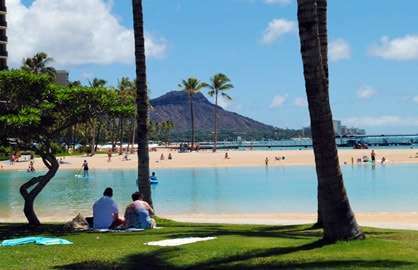 WaikikiOceanfrontRentals website is very responsive and organized as well, so the booking and payment process to the owner is smooth and easy. I have stayed in around 1/2 a dozen condos and hotels in Honolulu and this is by far the best place I have stayed. 5 stars, two thumbs up, highly recommended. 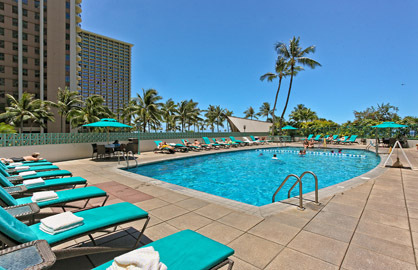 WaikikiBeachRentals.com is a website devoted to advertising and promoting luxury vacation rental units in beautiful Waikiki, Hawaii, providing advertising and software services to Hawaii vacation rental property owners and managers. 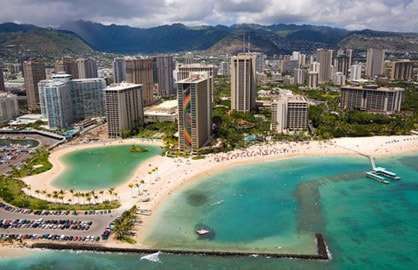 WaikikiBeachRentals is not a real estate broker, property manager, landlord or seller. WaikikiBeachRentals does not sell or offer to sell, buy or offer to buy, or negotiate the purchase or sale or exchange of real estate, or list, or solicit for prospective purchasers, or lease or offer to lease, or rent or offer to rent, or manage or offer to manage, any real estate or options on any of the rentals posted on this site, which activities, if any, are undertaken by the owners or property managers of such properties. Your rental agreement will be direct with the owner of the unit that you rent. 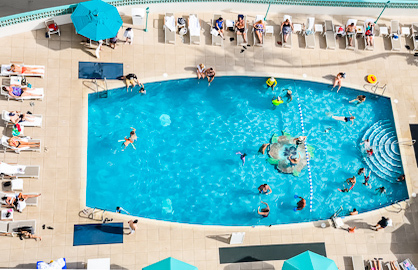 Terms and conditions of your rental agreement, including any amenities and services to be provided during your stay are set by the owner of the unit that you rent. Payments, including any deposits and refunds, are paid to, or received from, the owner of the unit that you rent. The Ilikai House Rules details all the rules and regulations of the main building. Neither WaikikiBeachRentals nor its owner, WOFR, LLC, a Hawaii limited liability company, is an agent of any owner or the property manager of any unit or property advertised on the WaikikiBeachRentals.com website, nor are either of them the manager or operator of the Ilikai Condos, Ilikai Apartment Building, Inc. condominium project or of any other property or project in which a unit listed on the WaikikiBeachRentals.com website is located. 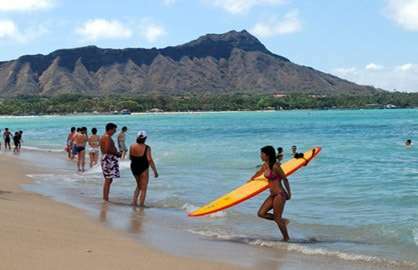 WaikikiBeachRentals is an owner direct listing Waikiki Vacation Rental website. 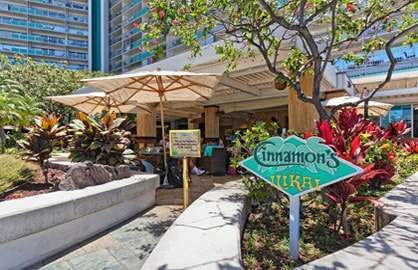 Our main offerings include: Waikiki Beach Vacation Rentals, Waikiki Vacation Condo Rentals, Waikiki Vacation Rentals By Owners and information on Things to do in Waikiki.